Fly fishing exile is when you wished you lived closer to the big rivers. Steve moved from Bozeman, Montana, to the Chicago area more than ten years ago. And Dave moved from Colorado to the Chicago area more than 25 years ago. We’ve grieved the loss of close proximity to blue-ribbon waters. Now, we’re not griping. We’re not complaining. Well, maybe a little. In this episode, we reflect a bit on our decision to move to the Midwest and discuss what we love most about our lives today, now that we live with ten million of our closest friends in the Chicago area. How close to you live to great fly fishing waters? How far do you drive to sate your fly fishing thirst? Post your stories below! Thanks for your podcast. Another exile here, living in Kentucky and dreaming of the clear-water rivers of the Gallatin Valley. One can always visit the rivers on vacations, however, and living in KY allows us to visit our families regularly (which is truly priceless). Yep, so true. Family is at the top of the list, for sure. Thank you for posting. Makes us feel as if we are not alone! I always look forward to your podcasts, and they make my Monday morning commute a lot better. I think that exile is a state of mind. I live in the heart of Washington, DC and don’t consider myself an exile. This year, I started keeping a fly fishing journal and found that I’ve been out more than 50 times. Those trips included Montana, tailwaters in Tennessee and brook trout streams in the Virginia mountains, but they also include Rock Creek Park which runs through DC, the Tidal Basin in front of the Jefferson Memorial and the Potomac River. It helps that I don’t see fly fishing as just being about trout (but I get and respect that you guys do); over this year I’ve caught brownies, bows, cutties, and brookies, but I’ve also caught smallmouths, largemouths, catfish, bluegills, crappies, and one very confused crayfish. If it swims, I’ll throw a fly at it. The trick is to fully embrace where you are at the moment: floating the Kootenai, I’m all in, but I’m also all in when I’m pounding the banks of the Shenandoah for smallies. I look to John Gierach for inspiration, he writes as lovingly about catching bluegills in a pond as he does about catching brookies in Labrador. well said Bob. I agree. I would even argue that it’s sorta cool to chase fish on the fly outside the trout game. Thanks, there are anglers chasing all kinds of fish on the fly these days, from tarpon to carp. I get why someone would choose a certain purist approach to fly fishing, it is, after all, about how you personally enjoy angling; but that purism has the cost of self-imposed exile. One of the great things about fly fishing is that it can be as narrow or wide open as you want and it’s all equally valid. I have to imagine these places will increasingly become more and more populated by the fact that tele-commuting has become so much bigger. Had I been born just 15 years later, it’s likely I could (Web developer who never works in the office) move to those parts of the country and maintain a blessed lifestyle. Hi guys thanks for the Podcast. As always I enjoy listening and particularly enjoyed this week. I learned to fly fish during my college years in DownEast Maine where you could catch wild brook trout right outside your door. After spending a number of years in rural Maine I then moved back to Boston Metro area I definitely felt like I was living is Fishing Exile. I live now in the Portland Maine area and enjoy being closer to good trout fishing and the saltwater opportunities Maine has to offer. While I have never have lived or fished out west (I hope to someday) I am a fan of the Longmire series as I could see many parallels to life in rural Maine. Next time you are in Maine chasing brook trout you should also try our Landlocked Salmon fishery! Beautiful fish and a lot of fun to catch. Thanks again & Tight lines! Fishing in exile and balance. Being a fifty something I no longer have the time or the energy to be as competitive with my fishing as I used to, but I’ve discovered the difference between quality vs quality. No I don’t fish every waking moment, driving like a mad man (or driving by Braille when I nod off and my tires hit the end bumps on the freeway). Instead I fish when I can enjoy it and fish to find peace of mind and soul. Great podcast. I live in the out west in fly fishing paradise – for one week a year. The other 51 weeks I live in northern Indiana — fly fishing exile. One thing keeps me here: marriage. I told my wife that if she dies first I am moving to Montana. Unfortunately (or fortunately, depending on how you look at it) she is in good health, so it looks like I’ll be in exile for a long time. So how does one cope with living in fly fishing exile? Two words: EMBRACE the BLUEGILL. There is always some kind of warm water specie nearby, no matter where you live. If bluegill are in the neighborhood, buy a 3-weight and a float tube and have a blast. If you live near smallmouth bass, even better. Granted, swinging a clouser for a smallie is not quite the same as casting a BWO to a rising trout, but it is still a thrill when you get that hit. Currently exiled in Fort Riley Kansas. Fly fishing around here is pretty much non-existent, but I think it’s a great opportunity to work on he problem solving aspect of the sport. Since I committed to figuring out the fishery here, I’ve gotten a lot more familiar with species and techniques I’d be completely oblivious to otherwise. Pulling hybrid stripers, smallmouth, and largemouth out of a muddy river with a skagit line is a ton of fun, and a great learning experience. I’d encourage all exiles to fish their local ditch and step out of your comfort zone. You might learn something. This particular podcast reinforced my decision two years ago to keep my full time ER physician in Richmond, Virginia (here, when Steve mentioned this particularly city on this podcast I thought he was talking to me!) and hire my services out to ERs for a few days per month in Rocky Mountain states and take a few extra days to go fishing for trout! My expenses have been paid for and it is the most incredible opportunity I’ve ever experienced! Most of my friends want to kill me! I’ve been able to fish incredible rivers in Montana, Colorado and New Mexico and I’m looking at other NW states. I’ve been able to balance my home life (my grown kids are in college and law school, and my wife runs a horse stable). My local fishing has suffered which is one downside. The other two are the incredibly time consuming scheduling and certification logistics and the uncertainty of getting an assignment. I also enjoy when you guys talk about the Yellowstone, Gallatin and Madison, and the Paradise Valley spring creeks that I was able to experience and long to get back to -and take in the Yellowstone National Park rivers that you have mentioned. I also want to try the incredible eating that you guys talk about. Love the Chop House in Livingston! When I was listening to your podcast it reminded me to be mindful of my prime responsibility to my wife and family, and I was also able to work in some local fly fishing with friends which is usually very good at this time of year (Winter) in Virginia. I also let my wife buy me a horse so we will do more things together, like western trail riding. Fortunately, she has no interest in fly fishing as she hates those slimy little things! I also have nephews out in DENCO and have been able to introduce them to fly fishing. I’ve also been networking with friends in Albuquerque and Bozeman that help me find good spots and often take me to their favorite spots. I am also grateful to my patients that appreciate me helping out their local communities that have difficulty getting physicians to work in their communities. Some patients in Livingston invited me to their private river access sites and told me of their favorite fishing spots! Thanks for the thoughtful and informative podcasts! You guys rank up there on the top of my podcast feed, say with Orvis and the Drake podcasts! 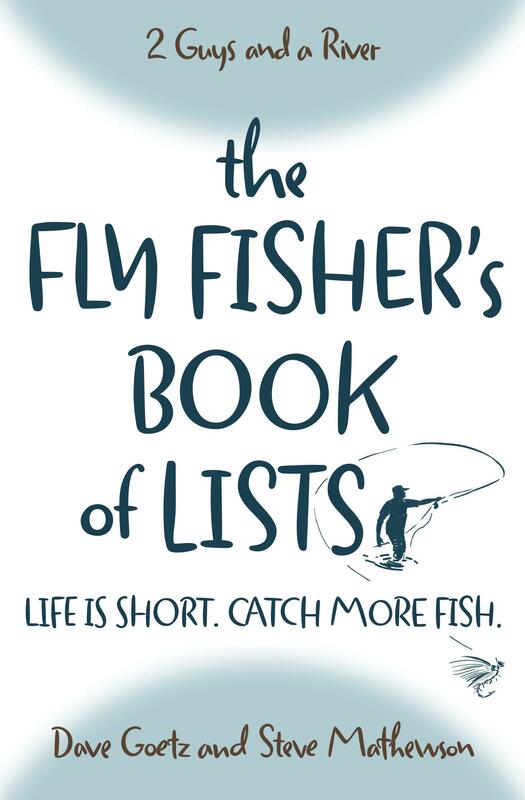 Santa dropped me a copy of your “Fly Fishing Book of Lists” and I really like it. I might just throw it in my fishing kit when I travel out to Montana and try to do what the lists actually recommend than just read about it!